Today I am so honored to be speaking with the amazing Judy Hall, who you might be familiar with because of her work on the Crystal Bible series of books. She has just come out with an amazing new book all about crystal grids, and I am so excited to hear all about it from her and share it with you. Ashley: I’m so excited to speak with you. This is a topic that has really become so popular over the past few years. Why do you think there is this new and sudden interest in crystal grids? Judy: Well, for me, I’ve used them for many years. It’s such a convenient way of generating energy. They are somewhere to put your intentions. Does that make sense? Judy: You can lay them out, set them up, and then they will work for you, and you don’t have to keep playing the intention. In fact, the more you can let them get in with it themselves, the more effective they are. Ashley: So, you recommend using them as more of a background energy? Judy: A powerful energy running in the background is how I would describe it. I think that they work on many different levels. They will work on what we think we need, but also, because crystals are sentient, intelligent things, much more intelligent than we are, they know what we really need as well. They also know and will work on what is needed around us. So, when I set up a grid, it’s not just a question of ‘what do I want?’ or ‘What do I think I need?’ — I always try to work with the crystals for the highest growth. Ashley: Oh, I love that. Judy: I’m not pushing myself deciding that. But if there is a bigger intention or a bigger outcome that they can bring about, I’m very happy to cooperate with them on that. Ashley: I love that. Judy, there are lots of definitions for what a crystal grid is or what a crystal grid should be. How do you like to define a crystal grid? Judy: That’s a tricky one, isn’t it? Because people understand different things by it. To many, it’s a pattern based on basic geometry, and that in itself, creates an energy. The crystals that go onto the grid work with an underlying pattern to bring energy into harmony. It can be really simple. I was writing the other day about a tombstone grid but I was actually keeping them either end as if it were an infinity symbol. Judy: It was around the immunity points on the chest. As you can well hear, I’ve had a cough and the English weather is not helping. We’ve got rain, fog, and all things that are not really good for breathing. So, I was setting up a crystal grid using some new cherry quartz and emerald quartz (which are being called tangerine). We found last year that it works best if you put some on the higher heart and at the base of the breast bone. It actually creates this infinity symbol that meets over the heart, and it’s very good for strengthening the immune system. Ashley: Oh, I love that. So let me ask you this: most people tend to think of a crystal grid as just being something that you would put maybe on an altar or something in your sacred space. But in what you just mentioned, you’re actually placing the grid on the body. How would you decide whether to use a grid on the body or just set up somewhere in your space? Judy: To me, it does rather depend on what I’m doing. If I want to balance my chakra for instance, that goes on my body. Although, if it’s going to be inconvenient to have crystals on my body for very long, I might equally setup a chakra grid on a tree of life grid or something like that. If I’m doing earth feelings or sending energy to a situation like trying to find the right job, then to me, that’s something that I will put either on an altar or tuck away in a corner of the house. Sometimes, I go outside to do it as well. At the moment, I have a grid set up on my dining room table. My dining room table rarely gets used for dining. It’s usually covered in crystals. But I’ve been trying to stabilize a situation. I actually wanted to put it on the floor but my great-granddaughter, who is four, came around yesterday. I thought, she loves the crystals, but kids, they want to run around. So, I thought, “Right, I’ll put it on the dining room table rather than on the floor.” I put it underneath a great, big piece of quartz, and then a great, big piece of flint to anchor it there. So, that was actually working to stabilize a situation at a distance. Ashley: Oh, I like that idea. Judy: That’s the intent of the job. Ashley: Yeah. I love that idea of using those additional large crystals. Judy: I live on chalk, and we have lots of flints around here. So, it is really my favorite anchoring crystal because all grids, for me, to my mind, actually benefit from being anchored into this level of reality. Even if you’re bringing in very high spiritual consciousness, as grids can do, I still want to anchor it to the earth because it’s no good if it’s floating a few feet above here. I think a lot of people do that. But also, there’s a lot of grids that you look at and think, “That’s lovely. It’s generating a silver energy. It’s bringing synergy. But where is it going?” It can dissipate unless you actually anchor it. That’s what I use flint for. I go out the back garden and pick a piece up if I need it. What are some other stones that we might be able to use to anchor that energy? Judy: Any grinding stone can work really well. Something quite simple like smoky quartz which is usually very easily available. Rock tourmaline also works well, as well as hematite. I also use fenty stone quite often. It’s simply because they ground me. What grounds me, I feel will ground a grid that I’m working on. What’s one of your favorite grids from the book, one that you find that you use frequently or that you just couldn’t live without it at this point? Do you have one that you’ve shared as a recipe? Judy: There’s actually two that immediately come to mind. The first one is Safe Space which is a very simple, square grid with black tourmaline and flint, just to create a safe space in which to work. If I’m doing readings or spiritual work, I want to be sure my space is safe. Also, I happen to live opposite a power station, so I want my space to be clear of elements. For this I use a very simple, square grid with those grounding corners — a stone on each corner. The other one that’s in the book that I really love came when I was in a second hand shop, a thrift shop. Is that what you call it in the States? Judy: A friend of mine, Elisa, was looking for a frame. She actually wanted a frame to make a picture with stones from the beach. So, she found a frame and in it was a very massive heart background. When she saw it, she thought yeah, you can’t throw that away. You can’t throw half away, and it’s so, we used it. Elisa helped me set up the grid. She got very excited about it as well. We had all these tiny little rose quartz hearts that I’d bought thinking they were much bigger, but they were perfect with a few other stones to outline the heart. We put crystals in that would bring in unconditional love. When you have quite a few, they add up so that when the world’s a little bit dark and dreary and everybody seems to be falling out, especially in winter, they combat that heavy energy. I would put it up, again on my dining room table, because that’s where it wouldn’t be disturbed for a few days. Even though it was a repurposed frame background that was a bit scruffy, it still shows that you can do a grid with anything. Ashley: Oh, I just love that story. Thank you so much for sharing that with us. Judy: I would tell everybody to go out and find what really fires up that creativity, because it will be good. You can make processed goods beautiful. I have some lovely wooden ones and ones on a crystal tray, they’re gorgeous. But you don’t have to spend money. You can draw your own. You can find something in a shop that just makes your heart sing. Add crystals, and now you’ve got a grid. Ashley: I love that. I just wanted to say, Judy, this book is absolutely stunning. From the quality of the material that you’ve included, the beautiful recipes that you’ve shared, and the drool-worthy photographs. These photographs get me so excited to go work with grids. Judy: I was so fortunate to work with Michael Ellis, who was the photographer of the grids. I’ve worked with him on the Crystal Wisdom Oracle Cards and on other things that I’ve done, and he is able to capture energy. Not all photographers can do that. The actual grids have got the energy in the photograph. I think that’s what makes the book come alive. You can work with some photographers who are concerned with the look of the thing, but when it’s crystals, you want the energy. He was able to capture the energy digitally so well with the crystals for the Oracle Cards, that if we haven’t got a particular crystal in the workshop, we’ll just use the photograph, use the card, and lay that on somebody, and they can feel the energy which is great. I can carry a pack of cards with me and not have to take a great big suitcase. You see me when I go to workshops, I usually have two suitcases. But I also have the healing cards for that reason. They’re just ready to use. You can lay them in a grid too which is great. Ashley: Oh yeah. Absolutely. Use the cards in a grid pattern. That’s amazing. Judy, it’s a stunning book. Thank you so much for sharing a little bit about the story behind the book and some of your favorite grids that are in the pages. Judy: I hope everyone will enjoy making their own grids as well. I’ve encouraged them to learn about grids by doing the ones in the book, and then you can use your own favorite crystals. Ashley: Oh yes. Well, thank you so much for joining us today, Judy. It was a pleasure. Judy: It’s been a pleasure too. Good to talk to you, Ashley. Ashley: You too. 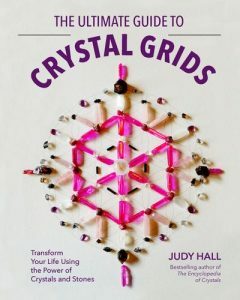 So, for all of you out there listening, I just want to encourage you to check out this amazing new book by the fantastic Judy Hall, the Ultimate Guide to Crystal Grids. You can go to quartoknows.com and find all the places that you can purchase this lovely new book from Judy. I am so honored to be speaking about crystal grids with Judy Hall. She has just come out with an amazing new book all about crystal grids, and I am so excited to hear all about it from her and share it with you in this interview. Thank You so much Ashley & Judy, I so loved this podcast. It has reassured Me about some of the things I do & given Me more ideas to try. Bless You both. P.S. Thank You Judy for the info on Cherry & Emerald Qtz & using them for the Immune system. Both My Son & I have had Flu? & I’m sure this will help Us immensely to really get well. I hope You & Your English weather improve soon too. The timing for this is just amazing – yesterday I came across an article Judy had written on faience in Ancient Egypt and thought I’d like to read more from Judy and today Ashley’s interview arrived in my inbox ! Crystal synergy 🙂 Loved this interview and followed the link to the book -the photography is so beautiful! I love how much historical information is given for each of the grids and of course had to look at the oracle deck too ! I ordered both and can’t wait for them to arrive! Many thanks Ashley and Judy! Enjoyed reading this interview very much! Thank you for tuning in, Audrey! <3 Isn't Judy the best? <3 Crystal blessings! I just love building grids and watching what happens! July Hall is absolutely amazing! Thank you to both of you for the podcasts! Hi Hilary- We are so so glad you enjoyed the podcast and happy to hear it sparked some ideas! <3 Crystal blessings! J’aime beaucoup écouter Judy Hall, merci ? So glad you enjoyed it, Michelle! <3 Crystal blessings! Ashley thank you so much for this podcast. I so admire both you and Judy Hall. The information I found most helpful was that you don’t have to keep paying attention to the grids you set up. That it is more beneficial to just let them be to do their thing. Crystals are intelligent beings and know EXACTLY what they need to do for the highest good. Thanks again for all you do. Hi Robyn! Thank you so so much for listening and we are so happy that the info was helpful for you! <3 Crystal blessings!